What can I say about this cook book? Plenty. It is more than a cook book. It’s a book about down south and more. Take a trip down south without leaving home. Indulge your senses while taking in a bit of southern history. Most of the recipes can be made by anyone at any time, but not all. Some are a bit more involved and better reserved for a special occasion or dinner party. Think ‘hoity toity’. Inside, learn how to make some tasty and easy drinks in the chapter entitled, let’s start with a drink. Enjoy some decadent starters with old-school southern cocktail parties. Do a little barbequing in the chapter: Cook It Outside. Roast, Braise, simmer and fry in the chapter of the same name. Indulge in the unusual in Heads, feet, neck and bones with such dishes as Fried fish collars with Chile vinegar or pork trillions. 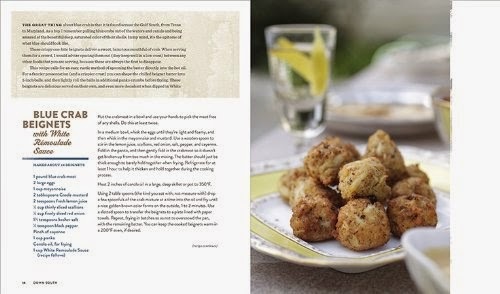 Do you have a taste for seafood, then you’ll find the chapter, Seafood from the gulf and south Atlantic of particular interest with recipes for crab and spinach dumplings, crisp fried frog legs or salt-crusted red snapper. Top off the recipes with Fresh Seasonal Southern sides and Southern-Style Sweets. With this cookbook, and most of the recipes, there’s simply no reason why anyone anywhere can’t cook as if they’re down south. A word of warning: This is not a cookbook for Vegans or those with small appetites. This is definitely a meat lover’s paradise and those with time to prepare the meals. Caveats as to why I give it just 4 stars instead of 5: It is not a healthy cookbook, vegan or everyday simple to make cookbook. If you’re looking to make a simple, quick to eat meal after work, this is not a cookbook for you. Neither is this a true ‘southern food’ cookbook. Unfortunately, this isn’t exactly the cookbook I was expecting. I expected a cookbook on ‘southern food’ recipes. There are some fabulous recipes here, and most are from the south, but not all. I counted at least twelve that originated elsewhere. If you are looking for a true ‘Down South’ cookbook about nothing but ‘southern food’, this isn’t it. Not all recipes are from down south. 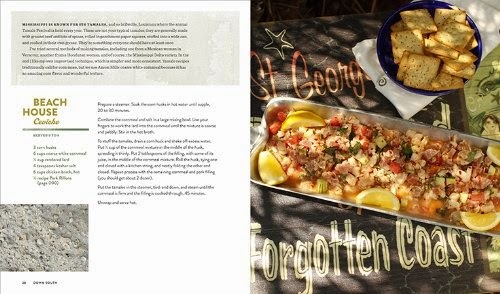 Link takes recipes he likes and adds them to the book with a bit of southern flavor. I live down south, in the Mississippi Delta and wanted a ‘real southern’ cookbook and though, this is a fantastic cookbook, it isn’t what this former Yankee hoped for. Overall, an excellent cookbook for food lovers, especially meat and seafood, and those who love southern food, or those with a hankering to learn how to do so. 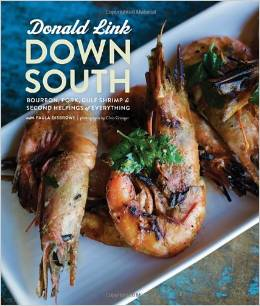 DONALD LINK is the chef-owner of Herbsaint, Cochon, Cochon Butcher, Pêche, and Calcasieu in New Orleans. He won the James Beard award for Best Chef South in 2007 and his first book, Real Cajun, won the James Beard award for Best American Cookbook. PAULA DISBROWE is the author of Cowgirl Cuisine and co-author of Real Cajun and Susan Spicer’s Crescent City Cooking. She lives in Austin, TX. FTC Disclaimer: I received this book in exchange for a honest review from Blogging for Books.